Going on two centuries, placer mining has been synonymous with the history of British Columbia. Yet beyond the nostalgic promise of “striking it rich” (which is rarely the case) the industry offers almost nothing in royalties or reward. However, it has contributed to the serious degradation of the province’s watersheds. From historic placer mining and its under-studied use of mercury in the Gold Rush era; to the modern-day mechanized operations that leave huge scars on our waterways; FMC opens a revealing window on the placer mining mystery and separates fact from folklore. 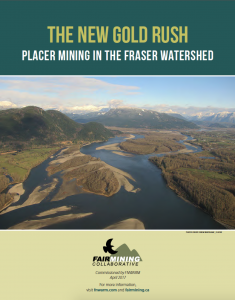 We continue our examination into placer mining, with a focus on the Fraser Watershed, the heart of British Columbia and former home to one of the most abundant salmon runs on the planet. 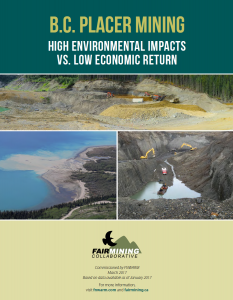 We highlight the effects of placer mining, continuing to this day, and reveal (among many other things), that based on the best available information to date, no placer mine has ever received an environmental assessment in British Columbia. 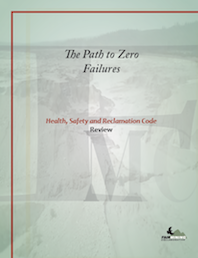 A groundbreaking and comprehensive analysis of BC’s Health Safety and Reclamation Code for Mines (“HSRC”) and Mines Act, The Path to Zero Failures outlines the many changes the BC government needs to make to the HSRC and the Mines Act, in order to prevent future catastrophic failures like that of Mount Polley in 2014. 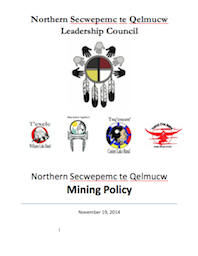 This policy, developed by Fair Mining Collaborative, and based on our Fair Mining Practices: A New Mining Code for British Columbia is comprehensive, detailed, and clearly spells out what is expected of industry and government when operating on Northern Secwepemc territory. 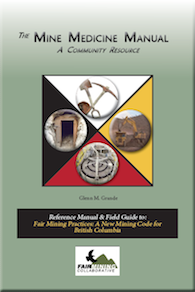 The Mine Medicine Manual is a user friendly, interactive, graphic field guide covering everything you want to know about mining in BC in under 150 pages. 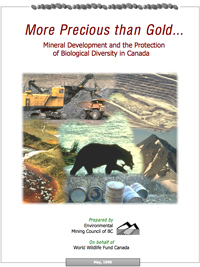 Based on Fair Mining Collaborative’s Fair Mining Practices: A New Mining Code for British Columbia, The Mine Medicine Manual is a helpful and practical tool for all communities curious about, or affected by mining development. The Manual is tailored (but not confined) to use by First Nation resource managers, councilors, teachers, students, and the public at large. The Manual encourages a “hands on” approach, and covers the whole mining life cycle. 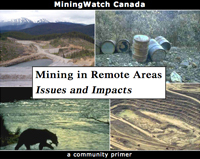 Readers learn how to perform jobs of a resource manager: checking mining claims, researching mining companies, informing the community, media outreach, inspecting drill sites and mine sites, water and soil sampling, accessing key government and industry agencies, and more. 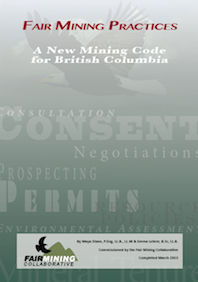 Focusing on positive solutions to complex mining issues, the “Code” is a compilation of innovative mining laws from around the world applied to the issues faced by First Nations and other communities in British Columbia. A multi-purpose document, it is a valuable resource for communities whether they are developing mining and resource policies based on traditional laws and customs, negotiating with mining companies, grappling with the new tide of internet claim-staking, or searching for solutions to the legacy of mines. Click here to view in HTML. 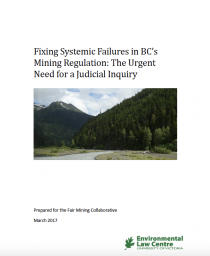 The request for inquiry is in response to systemic failures noted by a recent Auditor General’s report and exemplified by the Mount Polley Mine disaster. 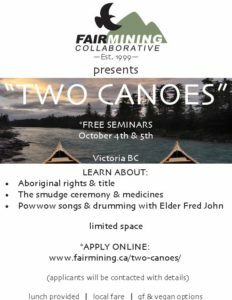 BC’s “free entry” Mineral Tenure laws are outdated and do not protect the interests of First Nations and private land owners in BC. 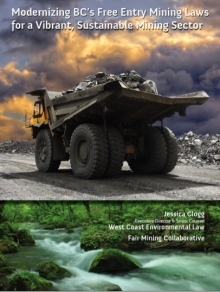 This report, which is a joint project between West Coast Environmental Law and the Fair Mining Collaborative, tells the stories of people effected by “free entry” laws and proposes changes to BC’s mining law that will better serve British Columbians. An overview of mine developments proposed in British Columbia, many within key wilderness areas and watersheds, and the impacts that need to be evaluated. Prepared by the Environmental Mining Education Foundation for the Wilburforce Foundation 2012. Please let us know if you have suggestions for our resources & links listings.